Last edited by asynartetic; 06-15-2016 at 07:22 AM. 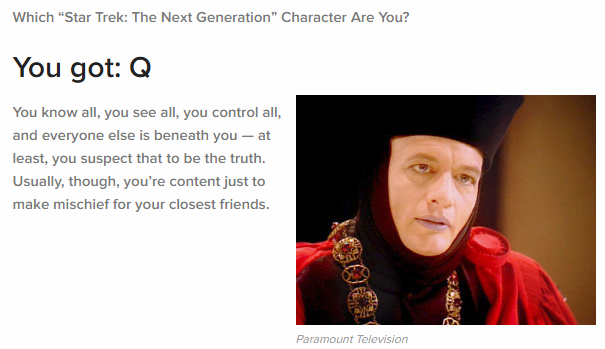 I got Q also, we are like twins from another mother with different dna and a different birthday. You’re the born leader everyone can rely on, and sometimes that makes life a little lonely. You’re far more keen on talking out differences than resorting to violence, and while your love of obscure cultural pursuits causes some to roll their eyes, you don’t apologize for living life to its fullest. Also, you might be bald. You can fix pretty much anything, and you love to figure out how things really work. But your easygoing nerdy demeanor hasn’t been great for your love life. Also, you probably have a thing for unusual glasses. You are so deeply in touch with your emotions and everyone else’s emotions that sometimes it can get on people’s nerves — and your nerves as well. People are constantly underestimating you at their peril. Also, you’re probably smoking hot. Geordi! Nobody got Data, I noticed. Is he not an option?